Drama on the High seas. Saturday, Divers Den North had a charter to the Stolt. Everybody loves this wreck. The drive out was spent weaving and dodging the flotilla of recreational boats. Apparently there was a fluke tournament, and the masses had turned out. When we reached the Stolt, Terry jumped in to set the hook. Watching him descend, it was obvious that surface vis looked much better than the week before. However, when we pulled up a dragger had passed very close to the wreck. This raised concerns about the vis on the bottom. Terry had us tied in quickly, and the pool was open. 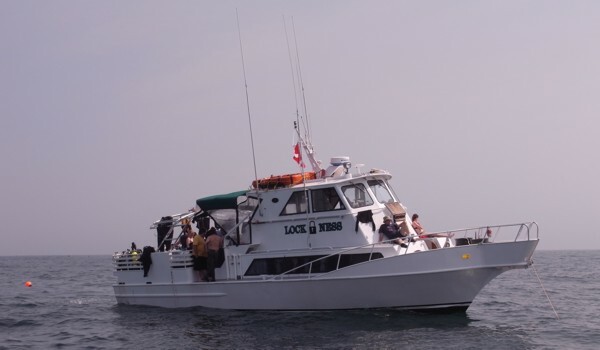 As divers were rolling in, the Lockness arrived from Long Island, and asked to join us. Before long they were tied in, with their boat just off our stern. Captain Dan seems to know everyone. We were soon exchanging stories of dives, trips, and artifacts. Divers started returning with bags of scallops, bugs and mussels. A couple of nice tog came up also. From the reports the temperatures had not changed much, but the visibility was just the opposite. of last week. It was clear on the surface, and only 10 feet or so on the wreck. I rolled in with a student, and we headed for the bottom right along the break. The reports were accurate, the vis was bad, with some surge at the top of the wreck, and current past the hull. We did a quick tour of the break, then headed slowly up the super structure. We poked our heads in a few holes, but the vis was just as bad inside. One interesting observation was the number of scallops on top of the wreck, and on the flat surface of the superstructure. While we were in the water, a boat in distress was reported in our area. We got underway quickly, and sped off to assist. Upon arrival, we could see that the boat was low in the water, but they had stopped taking on water. We escorted them toward shore until the Coast Guard arrived on scene. Nothing like a little drama on the high seas. It’s been a few years since I’ve had the opportunity to do a Northeast twilight dive. Some of our deep dives seem like night dives, but a twilight or night dive on a shallow wreck is a different story. As we approached the wreck the sun was getting ready to set behind us. This was a low lying wooden wreck, so Bill looked carefully for a good piece to drop the hook on. By the time I cleared 20ft my light was the only thing visible before me. On the bottom, the line was right on top of a large rib. We were soon tied in, and it was time to reconnoiter. Given this was my first dive on this wreck, my standard practice is to look around first, then decide on a plan of action. Within a few feet of the line, the telltale signs of lobster were evident. Here, there, everywhere. They were not coming out yet, but there were quite a few in some deep holes. Sea bass were everywhere, and some were quite large. Tog and ling cod where here and there. Sea Robins were all over the sand. Even a nice Conger eel was swimming about freely. It was bit startled by my light. Swimming up the main rib, there were also signs of fluke, and large ones. All of this was very bad, since my weapons were on the boat. After coaxing a 22 inch fluke into my bag, I headed to the surface for reinforcements. The remainder of my short dive was spent mapping out the wreck in my mind, and collecting fluke along the way. Like most wooden wrecks, there was a nice chain pile at the bow. Many fish and lobster were entrenched here. Some low lying sections stood just a few inches off the sand. Here, Sea bass darted in and out in response to my light. Back on the surface, the sun had set, and Bill was getting ready to jump in. As the divers came up they all agreed that this was a great dive, and we should do it again. At this point Captain Dan regretted leaving his gear at home. After a short while, we could tell Bill was at his safety stop by the aura of his HID light: 20-30 foot arcs of light. It’s kind of eerie to see the water lit this way at night. If you’ve never done a night dive here in NJ, I strongly suggest giving it a try. The Independence II headed out on Saturday with clear skies and a forecast calm seas. Well, by the time we returned, they were calm. However, on the way out it was a little rough, but mostly a medium period swell. When asked where the passengers wanted to go, the decision was for the Stolt. Upon arrival, I splashed to set the hook. I must admit to being a bit nervous since we had just returned from our North Sea Expeditions, and I had only unpacked my gear the night before. The configuration was a bit different from what we used in Belgium, and I did not have much time to test out the rig. Another trial by fire. Dropping down the visibility on the surface was not great. Once past the thermocline at 40 ft, it opened up a bit, and I could now see the line before me. Within a few minutes, we were tied in, and I started looking about. Despite the swells above, there was little to no water motion on the wreck. No serge or current. Visibility here was a good 40 ft, but dark due to the murky surface. Large tog were swimming in and out of holes in the wreck, and along the hull. Here they picked at the mussels growing there. Cunners are everywhere on this wreck. One nipped at my glove while I was working with the chain. They keep hang out in front of my mask. I assume they are looking at their reflection, but I’m not taking changes that they want to nip at my lips (the only exposed skin). At 100 ft, there was a second thermocline where the temp dropped to 46 degrees, and the visibility dropped down to 20 ft. The ocean floor was covered in winter flounder (out of season of course), and skates. A few small lobster were about, and one reasonable one way back under the rudder. Ling cod were about in large numbers, and many of them were large in size. After making a full circle around the wreck, I headed back to the line. I cut the dive short figuring, next dive, I’ll bring a either a weapon, or camera. Back down on the wreck the visibility seemed to have dropped a bit. Other divers were swimming about, and the tog visible on the first dive were no longer around. The decision was to drop down to the bottom and try for some of the Ling, then wait for the other divers to clear out and see if the tog would show up again. The first part of the plan worked well as Ling are not all that bright. On a previous dive, I recall dragging the line across one wreck, with a ling cod in my face the whole time I was wrapping the line around a beam. Today, even after missing a shot at one, it only retreated a few feet, and I got him on the second shot. Once a few of the larger ones were in my bag, I started to head up to look for some tog. The other divers were still down on the wreck. In one area, large plumbs of rust colored water billowed from openings. Other areas also showed evidence of activity. I was able to get close to a few of the tog, but none of the big ones. Off in the distance a large gray one darted around the corner. However, he never let me get a clear shot. I guess they don’t get big by being dumb. Along with my bag of fish, a few lobster came up, a bag of mussels, and a couple of bags of scallops. We headed off to another wreck for the second dive. This was a low lying wooden wreck, with very few spots to attach a chain. Brandon found a good one, and the pool was open. This wreck is often covered with lobster, but this time was also covered in scallops and skates. Many bugs and a few bags of scallops came up. Personally, after spending over two hours on the Stolt, I was done for the day. I splashed to pull the hook, but had no energy left to look around. This was probably good, as I felt a cold trickle down my leg as soon as I hit the water. Somewhere along the line, I must have poked a hole in the suit. The trip back was on calm seas. It had been a great day of diving, and it was good to be back in NJ. Boarding the dive boat Cdt. Fourcault style! Here’s a little video clip showing the diver boarding procedures used in the North Sea aboard the Cdt. Fourcault. Ascent is not up the anchor line, but on a drifting “shot line”. At the top is a large (4 ft) ball. Attached to the ball is a tag line. Once you hit the surface, you hold onto the tag line waiting to be picked up. The RIB picks up one diver at a time and bring them back to the mother ship. Attached to the back of the RIB is a foam raft (boogie board). The diver climbs aboard the raft, and the RIB heads back , diver in tow. In 8 ft seas, this is quite an experience. Once alongside the diver rolls off the raft, and drifts over to a cage/platform that is lifted up onto the main deck. No ladder! Last week, a few friends and I had the opportunity to join the North Sea Expedition 2009. This was an all CCR trip to visit some untouched wrecks. The trip was coordinated by a group of Belgium divers who were gracious enough to invite groups from the UK, and the USA. The dive platform was the Cdt. Fourcault, a 150 ft converted military vessel. The owner/captain, Pim, lives aboard with his lovely wife Angel. They hosted the entire group in their “home”. At the beginning of the week Pim made a comment that the highlight of the week is not the diving, but the people. His words could not have been more accurate. I’m not down playing the diving, but it was overshadowed by the people we met. First, the Belgium dive group did a fantastic job of putting this trip together! I can not say enough about how smoothly and professionally this was carried out! Not only did they plan and coordinate the diving, but also supplies (tanks, weights, sorb …), transportation, and even dinner plans in town. Second, Pim and Angel were two of the best hosts anyone could ask for. Can you imagine having over 20 people staying in your house? Meeting, diving, and spending time with them was one of the trips highlights! They also had a great crew assembled for the trip. They all kept the ship and dive operations running smoothly, and safely all week. In addition they were fun and interesting people to meet and work with. In addition to our hosts, many other great divers were aboard for this trip. We spent long hours laughing and talking about trips, techniques, and gear: what works, what doesn’t. Just a great group to spend time with. Now lets talk about the diving. Dive operations were very different from here in the Northeast US. 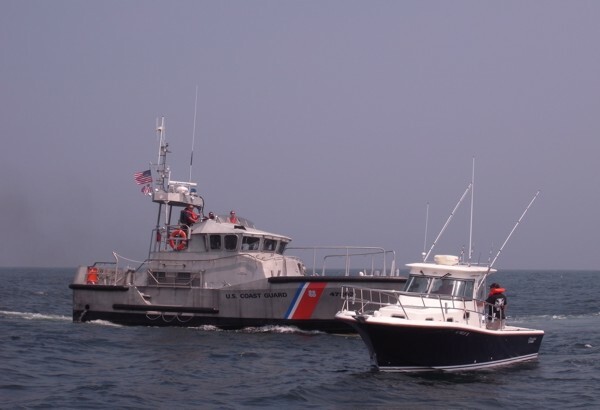 We have some areas around inlets and sounds (Block Island and Rode Island for example) where dive operations must be scheduled around the slack tides. In the North Sea, all dive operations seem to revolve around the tides. There is a dive window of around 2 hours. At the start of this window the current is dropping down to a manageable range. During the dive the current eventually stops completely, and reverses. The trick is to get back on the line before the current picks up and becomes unmanageable. To operate in these conditions, divers use some different techniques than we use here. The ship does not anchor into the wreck. Prior to dive operations, shot lines are dropped on the wreck. Theses use large weights, and grapnels to drop quickly to the bottom, and hook the wreck. Next the dive vessel is positioned up current of the shot line. If possible, the vessel will anchor in this position. However, based on wind and current, this may not be possible. Divers then jump in and drift to the buoy on top of the shot, then descend to the wreck. The first divers secure the line into the wreck. Each diver attaches a marker to the line, and removes it when they head back up. The last diver unclips the line, and the entire group drifts with the shot line. A few techniques that are specific to the Cdt. Fourcault: Jumping into the water involves a 12-15 ft drop from the main deck. Now that’s a Giant stride! Any time divers are in the water, one of the three RIB is standing by to assist. At the end of the dive, the RIB can bring the diver back from the shot line. If conditions are right, the diver can simply drift back in the current. Once alongside the diver swims into a platform that is lifted up onto the main deck. No ladder! This combination of techniques allows for operations in much heavier seas than we would normal consider locally. Since the sea conditions on the North Sea are normally rougher than we experience here, this is a necessity. The US divers were subjected to a trial by fire on the first dive. Jumping into 8 ft seas and swimming to a buoy barely visible between swells. Once there we descended to the wreck into a strong current. On the wreck we enjoyed searching about for artifacts, as well as seeing an abundance fish life different from our own. During the ascent, we hung on the line like flags in the wind. After the shot line was unclipped we then drifted along like plankton. 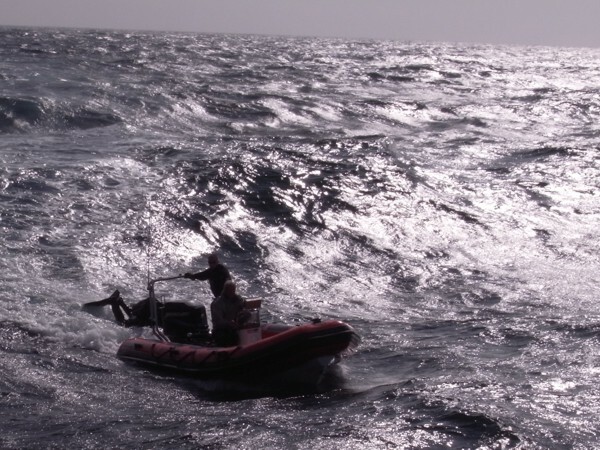 Back on the surface, we bobbed about in the swells until, the RIB picked us up, one at a time. Attached to the back of the RIB is a foam raft (boogie board). The diver climbs aboard the raft, and the RIB heads back to the mother ship, diver in tow. In 8 ft seas, this is quite an experience. Again, I must say thanks to the Belgium dive team for their work in lining up a number of great dives. Many of the wrecks had not been dived before, and we all accepted that they may or may not be worth the effort. For the most part the risk was worth the reward. Conditions on the bottom varied from 10 ft to over 30 ft of visibility. One advantage of the strong tidal current, there is no thermocline. The water was 60 deg F from top to bottom. Some of the wrecks were intact or nearly so. Others were debris fields in the sand. One wreck was completely engulfed in a sand bar, leaving only the bow, and small tips of debris visible. Others stood up prominently, providing large areas with easy penetration. Here inside the wrecks many artifacts were recovered. Portholes, plates, bottles, spoons, placards, even a telegraph, were all brought into the daylight for the first time in many years. I’ll try to add more details on individual wrecks, but this post is long enough. Let me end by saying, it was a great trip! Good dives, good friends, good Belgium beer. Click the image to see all the slides. Video: How to board a boat Cdt. Fourcault style!